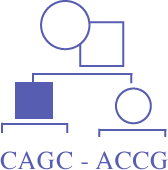 We offer membership options for practicing and non-practicing genetic counsellors, genetic nurses, genetic counselling students, and other professionals interested in genetic counselling. Membership renewal occurs on July 1st of each year. Full and Associate members will be able to renew at a rate of $125 until July 17, 2018 (subject to change with BOD approval). After July 17, the full amount above will apply. There will be no prorated dues. To join or renew your membership, click here . For more details, or if you are unsure if you qualify for membership, please contact the CAGC head office (CAGCOffice@cagc-accg.ca).